we, the tellows team, sincerely wish you a happy new year! This entry was posted in App suggestion, General, nuisance calls, Telephone Scam, tellows API and tagged annual review, Caller ID & Block, comments, ratings, tellows app, tellows magazine on Thursday January 17th, 2019 by tellows.de Team. The tellows magazine is now here for download! 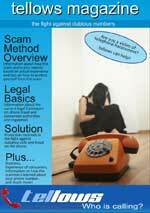 Based on information compiled from the tellows website, its blog and from concerned authorities in the UK, the tellows magazine provides the most important things you need to know in order to avoid being scammed over the phone. How useful is this magazine to me? You could be the next target victim of phone fraud. Even if you are registered with TPS, it does not spare you from the threat. In fact, 57% of those TPS-registered numbers are not satisfied since they still receive an average of 7 unsolicited calls per month, based on the UK Consumers’ Association report. 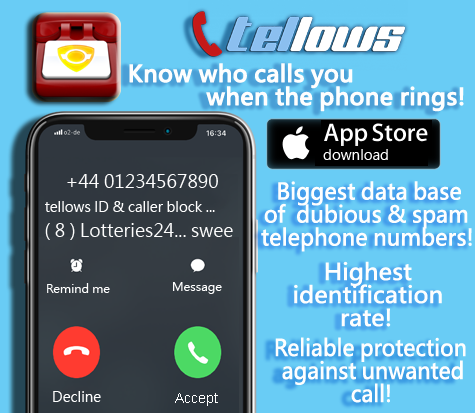 Statistics from the tellows website also shows that Greater London receives the highest rate of unwanted calls, followed by the North West part and Yorkshire. This does not mean that other regions are not being targeted, rather, reports and complaints in tellows website are actually coming from all parts of the country. That’s why it’s important for you to be aware of these scam methods and be proactive in guarding yourself and family against fraud. tellows has identified these top 10 scam methods based on the actual reports of users submitted to tellows website. These are: online payday loan scam, call back, job offer, fake telemarketer, spoofing, vishing, ppi, pc doctor scam, lottery and winning scam, pension liberation fraud. One scheme would ask you to pay fees in advance so they can process your loan, PPI, pension, job and training application, or your winnings in a lottery or contest. Another kind would send out messages that sound like an emergency or would ring your phone incessantly just to make you call them back. While the last type would pretend to be calling from a valid number, or would use the name of a legit company and brand, as if offering their products and services. The magazine also gives you an overview of the Data Protection Act and the three most important regulators and agencies involved in this area. Direct links on where you can send a complaint are provided, whether it is about an unwanted live telesales calls, automated marketing calls, silent or abandoned calls, or unwanted spam text message. 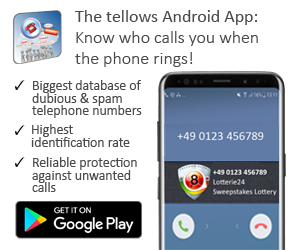 For an immediate, everyday protection, details about how the tellows website, its blog and smartphone app work can also be found in the magazine to solve your worries and doubts on unknown numbers. This entry was posted in Knowledge, nuisance calls and tagged nuisance calls, scam methods, scam protection, tellows app, tellows magazine on Tuesday March 11th, 2014 by Grace.